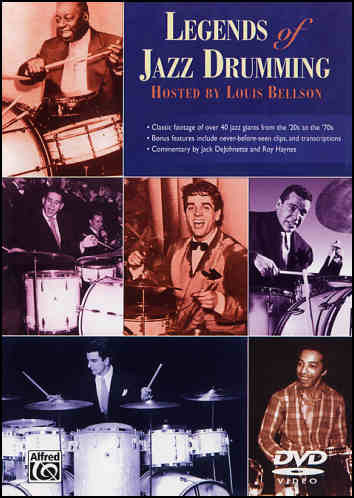 This DVD covers the legends of jazz drumming from the pre-1920s through the 1970s with still photos and rare film clips. Let's check it out. Some of the jazz legends like Baby Dodds, Ben Pollack, and George Wettling, are only covered in words and still photos but many of the key drummers are shown in video clips that give you a good idea of their groove capabilities and, in some cases, solo work as well. The Legends of Jazz Drumming DVD, whose material was originally contained on two VHS tapes, consists of two major sections. Louie Bellson supplies the narration throughout with additional commentary by Roy Haynes and Jack DeJohnette. Tony Spargo is shown playing with the Original Dixieland Jazz Band on the first record to contain a drummer. Sonny Greer (drummer with Duke Ellington from 1919 to 1951) shown in a brief clip featuring some of his stick tricks. Chick Webb whose great drum technique and musicianship affected nearly every drummer who followed him is shown in the only (very brief) film clip known to exist. Gene Krupa who combined all that came before him and rolled it up into a style that, together with his tremendous showmanship, brought the drums out front for the first time as a true solo instrument (Krupa, through his work with the Benny Goodman Band in 1935 through 1938, was the first jazz musician to become a matinee idol!). "Papa" Jo Jones the recognized father of modern jazz drumming, with his great hi-hat and brush technique, is shown with the Count Basie Band. Louie relates a story about one particular afternoon at Newport where all the drummers were featured including Louie, Buddy Rich, Joe Morello, Roy Haynes, and Elvin Jones. They all played everything in their bag of tricks and then Jo Jones came out with just a hi-hat and a pair of sticks and Bellson says "when he finished we all looked at one another and said, good afternoon!" Included are two clips with Basie and a clip of Jo Jones playing a solo. "Big" Sid Catlett was one of the few players who successfully transitioned from traditional jazz to swing to bebop working with everyone from Louis Armstrong to Charlie Parker in the process! Shown using his skillful brush chops (including trading fours) with the John Kirby Sextet from 1946. Louie relates some stories about Big Sid, who was one of his teachers. Dave Tough, according to Louie Bellson, one of the greatest drummers who ever lived is shown doing what he did best - swinging the band! Ray Bauduc is shown with bassist Bob Haggart in 1941 playing "Big Noise from Winnetka." Cozy Cole whose career began with Jelly Roll Morton in the 1930's and continued through early bebop with Charlie Parker and Dizzy Gillespie, is shown trading solos with trumpeter Roy Eldrige of the Roy Eldrige Sextet circa 1958. Note: Check out the stick grip Cozy is using! Louie Bellson, father of the Double Bass Drum, plays with the Duke Ellington Orchestra (1950). Louie first designed and built a "crude" double bass drum setup in his dad's music store in 1938. Buddy Rich shown soloing with his orchestra in 1943 and again with the Harry James Orchestra in 1965 (Check out Buddy's stick grip on this one!). Kenny Clarke began to experiment, as early as 1939, with a new style of drumming where the "ride" beat shifted from the snare to the cymbal and the bass drum was used for occasional accents rather than the usual four on the floor! This was later known as bebop! Kenny is featured trading fours with the Lucky Thompson Quintet from 1960. Max Roach in a clip showing his musical approach to the drum solo with his own sextet from 1958. Shelly Manne on his first major gig with the Stan Kenton Orchestra in 1947. Art Blakey with the Billy Eckstine Orchestra in 1947. Drum Battle at Dodger Stadium (1962) starring Gene Krupa, Louie Bellson, and Shelly Manne. Shelly Manne and his friends from the "cool" school of jazz (1958). Vernel Fournier with the Ahmad Jamal Trio in 1959. Chico Hamilton with his Quintet circa 1957. Connie Kay with Modern Jazz Quartet (1964). Joe Morello with Dave Brubeck Quartet in 1960 (Watch for that left hand!). Art Blakey and the Jazz Messengers at the forefront of the Hard Bop movement in 1961. Philly Joe Jones with the Bill Evans Trio and with the Sun Ra All Stars. Ed Thigpen in very brief clip with the Oscar Petersen Trio (1962). Jimmy Cobb in another brief clip with the Miles Davis Quintet (1959). Roy Haynes in a brief drum solo clip. Sam Woodyard with Duke Ellington Orchestra (1965). Sonny Payne with Count Basie Orchestra (1959) in a great clip of an extended drum solo. Mel Lewis with his Jazz Orchestra. Elvin Jones changed the style of drumming with his polyrhythmic approach that gave the drummer more freedom than ever before. Shown here in his work with the John Coltrane Quintet (1964) and in an extended drum solo. Jack DeJohnette in an extended solo (brief clip) with the Charles Lloyd Quartet (1967) and also with Sonny Rollins. Tony Williams, child-prodigy who was playing with the pros at the age of 11, joined Miles Davis from 1963 to 1969. He was the perfect drummer for Davis as he move from experimenting with the freer modal jazz forms into jazz fusion. Tony is shown here with the Miles Davis Quintet in 1967, a very brief clip with Herbie Hancock, and with Wayne Shorter / Ron Carter. The DVD-ROM features include half a dozen drum charts in PDF format of various performances contained on the DVD featuring Gene Krupa, Shelly Manne, Max Roach, and others. Also included are clips of drummers playing in various musical situations taken from motion pictures and dedicated music performances. Featured drummers are Shadow Wilson (1943), Big Sid Catlett (1947), Don Lamond (1948), Ray Baudac (1951), Shelly Manne (1958), Sonny Payne (1964), and Max Roach (1982). As you might imagine, any attempt to cover the entire history of jazz drumming is a daunting task to say the least and it just isn't possible to include everyone. Those drummers who made significant contributions to jazz but could not be included in video clips are listed in the concluding chapter of the DVD. The legendary drummers who are included are represented quite well through various video clips covering their performances. The one slight downside is that the length of some of these clips are quite brief leaving me with the feeling that I sometimes wanted more. That said, I highly recommend this DVD. I feel it belongs in every serious drummer's collection, regardless of style, as it does a fine job of covering the most famous drummers in the history of the original American art form we call Jazz! Credits: Produced by Paul Siegel and Rob Wallis, written by Associate Producer Bruce H. Klauber, and Executive Producer is Sandy Feldstein. If you're a fan of classic jazz drumming, be sure to check out the other DVDs available - listed at the top of the right hand sidebar on this page.